Below is a listing of all the KEY shipmates that have visited this site and submitted their information. 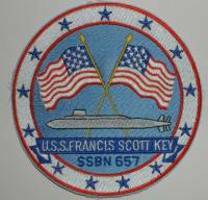 If you wish to contact a shipmate who is on the listing, just drop me an e-mail at ssbn657@comcast.net with who you are and who you want to contact and I will respond via return e-mail. If you have a personal web site, let me know and I will link your name to it. Bass, Daniel L. Eternal Patrol late 70's?? Barrows, Chris H. Eternal Patrol LA 86 - 90? Giancola, James F Eternal Patrol Blue 71 - 74? Hoel, Ira Jack Eternal Patrol OH Gold XO 6? - 7? Jones, Scott Benton KY Blue Weapons ?? *Tommy, Bob Redmond OR Gold A-Gang 65 - ? Tulodieski, Donald Sr Eternal Patrol Gold Lt - Nuc Pwr 69 - 71? *Valella, Michael D. Jacksonville FL Blue Weapons 65 - ?? *Van Camp, Earle Bozrah CT Gold Weapons 65 - ? ?